Likes: Naps, playing with stuffed toys, and going for walks. Teddy is such a gentleman pug! 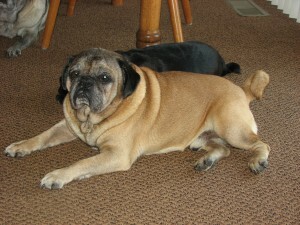 Since arriving at his foster home he has met 3 pug siblings, several cats and kittens, horses and 2 children. He seems to love them all!! He enjoys taking naps with his pug siblings, going for walks exploring the acreage of his foster home and chewing on his stuffed animals. He has lots of quiet energy and would be excellent for a busy family with children, although he would be happy in most any type of new family. He had no trouble with stairs and has had no accidents in the house. He does wear a male wrap most of the time in the house, but he has been learning quickly that marking is not appropriate. He is a very sweet guy who is just a joy to have around.